NUS chemists have developed a new class of crystalline materials to potentially harvest near-infrared (NIR) radiation. Nonlinear optical process (NLO) describes the nonlinear behaviour of light as it enters a suitable medium. This process has wide-ranging uses that include 3-dimensional (3-D) data storage, 3-D microfabrication, high resolution imaging and optical limiting applications. Upconversion fluorescence is one such process where lower energy photons (typically two, in a two photon upconversion process) combine to give a single photon with higher energy. There are many types of nonlinear materials that can exhibit such optical behaviour. Luminescent materials such as semiconductor or lanthanide nanoparticles are more attractive when compared to fluorescent organic dyes because they remain stable when exposed to light. However, the process required to attach organic molecules onto them is more difficult. 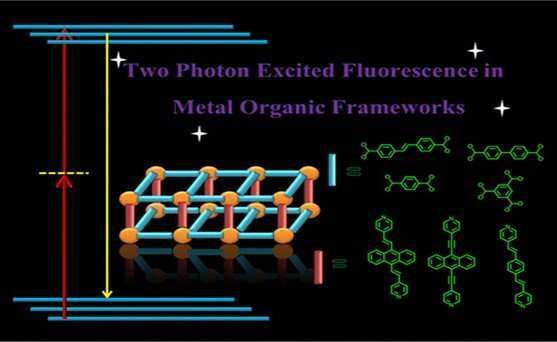 A new class of hybrid materials known as metal-organic frameworks (MOFs), which is built from organic spacer ligands and metal ions or metal clusters, is stable to light and allows for easy attachment of organic molecules. This makes them particularly suitable for two-photon upconversion process. Prof JJ VITTAL and his research team from the Department of Chemistry, NUS have developed new MOFs that are able to convert NIR radiation to visible light in the solid state. They discovered that the packing arrangement of the molecules responsible for the light upconversion is critical in determining the intensity of the visible light which can be emitted from it. Those with expanded structures having greater voids between molecules are able to give higher light conversion efficiency. Prof Vittal said, "The design of molecular solids with desired properties is possible from a better understanding of their intermolecular interactions." Building upon these findings, the research team is developing better upconversion materials with higher light conversion efficiency. These materials can potentially harvest the infrared, ultraviolet and visible light spectrum for solar cell applications.